Sixtus IV, given name Francesco della Rovere, Roman Catholic Pope from the 9th of August 1471 to the 12th of August 1484, was born of a poor family near Savona in 1414. He entered the Franciscan order at an early age and studied philosophy and theology at the universities of Padua and Bologna. He speedily acquired a great reputation as an eloquent preacher, and, after filling the offices of procurator at Rome and provincial of Liguria, he was chosen general of his order in 1464. Three years later he was, to his own surprise, made cardinal-priest of St. Pietro in Vincoli by Pope Paul II, whom he succeeded as pope. Some writers have maintained that this sudden elevation of the most recent member of the Sacred College was due to bribery in the conclave, whilst the apologists of Sixtus affirm it was due to the friendship of the powerful and upright Cardinal Bessarion, and explain that the pope, having been brought up in a mendicant order, was inexperienced and did not appreciate the liberality of his donations after his election. There is no doubt that the expenditures of his pontificate were prodigal. 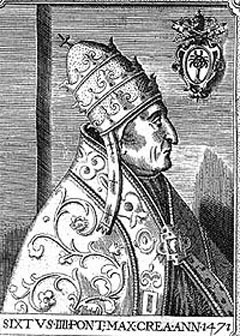 Sixtus sent Cardinal Caraffa with a fleet against the Turks, but the expedition was unsuccessful. He continued to condemn the Pragmatic Sanction in France, and denounced especially the ordinance of Louis XI which required (8th of January 1475) the royal placet for the publication of all papal decrees. He likewise continued his predecessor's negotiations with the Tsar Ivan III for the reunion of the Russian Church with the Roman see and for support against the Turks, but without result. He was visited in 1474 by King Christian of Denmark and Norway, and in the following year (12th of June) he established the University of Copenhagen. Sixtus soon abandoned his universal policy in order to concentrate attention on Italian politics, and the admirable energy which he had shown at first was clouded by the favors which he now heaped upon unworthy relations. Not content with enriching them by gifts and lucrative offices, he made their aggrandizement the principal object of his policy as a secular prince. Sixtus was cognizant of the conspiracy of the Pazzi, plotted (1478) by his nephew, Cardinal Riario, against Lorenzo de Medici. He entered into a fruitless and inglorious war with Florence, which kept Italy for two years (1478-80) in confusion. He next incited the Venetians to attack Ferrara, and then, after having been delivered by their general, Roberto Malatesta, from a Neapolitan invasion, he turned upon them and eventually assailed them for refusing to desist from the hostilities which he had himself instigated. He relied on the cooperation of Lodovico Sforza, who speedily forsook him; and vexation at having peace forced upon him by the princes and cities of Italy is said to have hastened his death. Several events of his pontificate are noteworthy: he granted many privileges to the mendicant orders, especially to the Franciscans; he endeavored to suppress abuses in the Spanish Inquisition; he took measures against the Waldenses; he approved (1475) the office of the Immaculate Conception for the 8th of December; in 1478 he formally annulled the decrees of the council of Constance; and he canonized St. Bonaventura (14th of April 1482). The most praiseworthy side of his pontificate was his munificence as a founder or restorer of useful institutions, and a patron of letters and art. He established and richly endowed the first foundling hospital, built and repaired numerous churches, constructed the Sistine Chapel and the Sistine Bridge, improved church music and instituted the famous Sistine choir, commissioned paintings on the largest scale, pensioned men of learning, and, above all, immortalized himself as the second founder of the Vatican library. These great works, however, were not accomplished without grievous taxation. Annates were increased and simony flourished. Though himself pious, of blameless morality, hospitable to a fault, and so exempt from avarice, says his secretary Conti, that he could not endure the sight of money, it was Sixtus's misfortune to have had no natural outlet for strong affections except unworthy relatives; and his great vices were nepotism, ambition and extravagance. He died on the 12th of August 1484, and was succeeded by Pope Innocent VIII.